Peter Grant, the narrator of Rivers of London , is just completing two years as a probationary constable and is guarding the scene of a murder in Covent Garden when he meets a ghost. Seeing ghosts is not an ordinary skill for a London copper but, to Grant's surprise, nor is it completely unknown. As a result, Grant comes to the attention of Chief Inspector Nightingale and finds himself in a rather obscure specialist unit. Grant is established as a mixed race Londoner early in the story and his expectations of a modern, multicultural London shape the novel. When he is sent to meet Mama Thames, he finds "nothing strange in the fact that the Goddess of the River was Nigerian" (p. 110). She is a representation of London as a global city, and her strength comes from "salt water and coffee, diesel and bananas, chocolate and fish guts" (ibid) and also from the new Docklands, the might of London as a financial center. Her daughters, the other rivers of London, are modern young, black women—Tyburn, for example, who prefers to be known as Lady Ty and has a double first class degree from Oxford. Beside this, the book is also interested in London history, relying on the antiquarian for much of its depth. Old Father Thames and his sons are white, olde England, though he is now the spirit of the freshwater Thames, as he "hasn't been below Teddington Lock since the Great Stink of 1858. He never came back, not even after Bazalgette put the sewers in" (p. 115). Both Mama and Father Thames are genii loci , spirits of place, affecting and affected by the locations they inspirit. The book is quite explicit on the use of Latin and Greek, as these were the academic languages of Isaac Newton, "the first man to systemise the practice of magic" (p. 79) as well as the inventor of modern science. There is a temptation here to recall Newton's role in Neal Stephenson's Baroque Cycle, but Rivers of London doesn't have the room to do much more than mention him. It does pay considerable attention to the methodology of magic, though. Grant is a man who wants to understand. "I want to know about it. Because that would mean we might be able to stop it happening again." "That is not a good reason to take on this job," said Nightingale. "Is there a good reason?" I asked. "I want in, sir, because I've got to know." An interlude with vampires describes their nature carefully, thereby assisting Grant with his investigation of how magic works. The brief presence of vampires helps create clear water between this book and that kind of "urban fantasy" with dark covers and leering shapes. Aaronovitch's vampires are pale, dull, and soon destroyed. 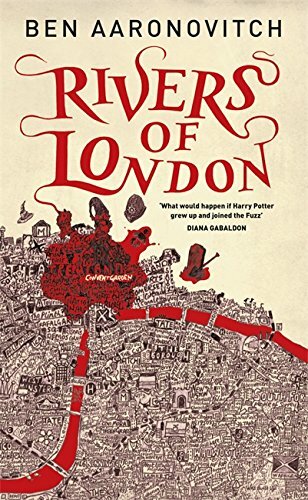 Rivers of London is, on the whole, a lighthearted book, which also distances it from the occult/noir style of Mike Carey's Felix Castor novels. 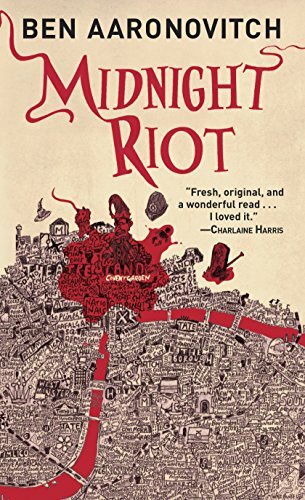 The distinctly cheerful attitude makes it occasionally reminiscent of Tom Holt's work, though Aaronovitch retreats from the absurd as the protagonist makes sense of the world he is plunged into. Nor is it prepared to take as extreme a transformative approach to London as China Miéville's Kraken , preferring to stick closer to the long strands of known history. As the first in a series, Aaronovitch is careful not to constrain himself too much. Beside the exploration of the arcane world, there is a parcel of proper policing to do. The murder which set the novel going is followed up by a series of increasingly gruesome deaths. There is an element of the police procedural here and the clues gradually determine the nature of the miscreant as thoroughly informed by London history. With the help of the clue in the (British) cover picture, this allows many an Anglophile reader to get ahead of Grant. In due course, Grant lays it all out, describing where the plot should go next. Of course, as soon as our narrator is confident of the story, it all goes awry and Aaronovitch quickens the plot effectively and tells a good riot (the source of the US title). However, the pace slackens afterwards and the final section of the book almost winds down at the same time as the personal danger to Grant increases. This gives the book a peculiar feel, as if the idea of the murderous spirit is more interesting than dealing with the consequences. Perhaps this is intended as an effect of Grant's exhaustion, as Aaronovitch uses the limitations of the first person narration to control the delivery of the story. Grant's police training in observation competes with a tendency to get diverted, particularly by delving into the obscure. This means he can present in perfect detail or suffer distraction as the plot requires. Grant also has a tendency to over-explain things which would be almost unconscious to a native of Britain —"At the end of March, the clocks go forward one hour to mark the start of British Summer Time" (p. 175). Whilst this is useful exposition for a global audience, it is also a reminder that the audience exists, that the narrator is telling a story and suggests that he is shaping it. Sometimes Grant can't tell because he doesn't know. He is witness to comments about "an arrangement" and a conversation about the fading of magic and a more recent "slow but steady increase in magical activity" (p. 75) but he doesn't have enough information to say much more than he hears. By the end of this adventure, it is clear that Grant still has much to learn, though the conclusion also unwinds some of the complexity to allow a fresh start in the next book. This reinforces my feeling that Rivers of London has all the delights and flaws of a pilot episode. It is bursting with ideas and tripping over itself in the need to deliver them and tell an engaging story too. The result is occasionally shallow, but there is hope for greater depth in the book(s) to come.